I got to see another side of Osaka last weekend when I accompanied the students from our school on a community service activity. We went to the Sanno Childrens Center in the poorest ward of Osaka, Nishinari-ku. The ward is infamous in Japan for its crime rates, red light district and homeless. Now this being Japan, a country with one of the lowest violent crime rates in the world, I felt quite safe and yes it did seem a bit run down and not as new and tidy as other parts of the city, but compared to disadvantaged districts in cities in other parts of the world, it is extremely safe. 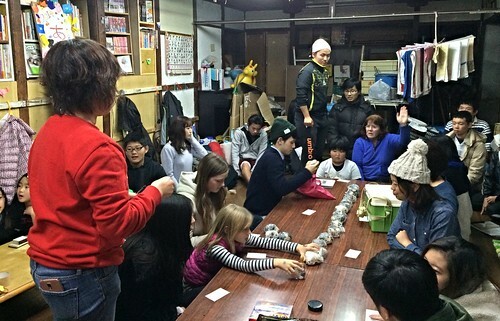 The Childrens (Kodomo) Center was founded in the 1960s by German missionaries. To this day, it continues to provide after school care and other services for children from the ward. 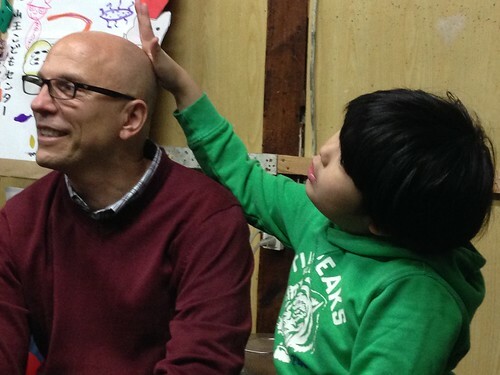 As you can see from the photo above, one of the children the center cares for was fascinated with my European, bald, head. One of the initiatives of the center is a monthly yomoguri or night patrol. Volunteers led by the pugnacious director of the center Mami, lead groups into the streets to deliver food (onigiri – spheres of rice wrapped in seaweed) and blankets to the homeless men sleeping in the streets of the shopping arcades in the district. I was filled with a sense of goodness seeing how grateful and kind the men were in talking with the students, including my 7 year old daughter. Mami gives us instructions for the patrols and you can see Ocean leaning over the middle of the table. Within Nishinari-ku is a neighborhood called Kamagasaki. This area is home to many male day laborers, who through a variety of circumstances (gambling, alcohol, mental illness) are homeless. The government forbids the official use of the name and they try to hide media from portraying issues in the area. A recent NHK documentary about the Sanno Childrens Center featured one of the orphans the center cares for and it has brought increased donations to them. It was sad to see them laying on newspaper with cardboard boxes around them as their only protection against the elements. It gets cold at night in Osaka in November. There are several organizations helping them, including a center to organize them finding short-term manual labor, free or reduced price shelters, etc. We also walked through Tobita Shinchi, another neighborhood within the ward. 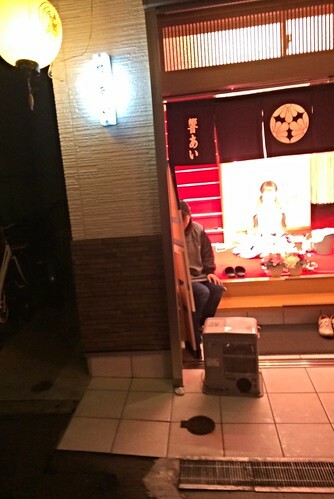 Tobita Shinchi is infamous for its red light district. As in Amsterdam, the women are displayed for street view, although here, it is open air and the architecture is old Japan style. They were only protected by an elderly woman minder that sat to the side of them. She yelled at me when I tried to take the photo (see below). The police tolerate prostitution, but again, I felt sorry for the girls, as it is a tough way to make a living. I was so inspired to help and want to make it a regular part of our experience while we are here. I would like to thank Lyn and Hannah for assisting me and Ocean and introducing us to the center. Hello ! I am looking to get connected with orphanages and ministries empowering/protecting at risk children in Osaka. I was googling orphanages in Osaka, and your blog came up. Do you have any suggestions of who to connect with? Just moved here and not sure at this point. If I find something, I’ll let you know.